In a world flooded with digital content, it is extremely easy to copy and remix the work of others. To help us understand what we can and cannot do with digital content, there is Creative Commons. Whenever we want to use someone’s created content (music, photographs, text, video, etc. ), we must first ask permission. 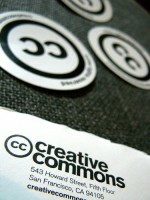 Creative Commons is a series of permissions content creators grant to others stating what can and cannot be done with the work. Here is an excellent (and brief) video that describes the various permissions content creators can apply to their work. Watch the video, learn more about Creative Commons. What permissions will you grant to others for using your digital content?